Of the mansions of the wealthy families who lived on the West 23rd Street block between 5th and 6th Avenues in the late 19th century—stockbroker Benjamin Nathan, the Joneses (whose daughter, Edith, would become famous as Edith Wharton), and Dr. John Gardner Ambler among them—perhaps none was so attention-grabbing as that of William C. Schermerhorn. By 1860 William Colford Schermerhorn, an attorney, was patriarch of the family. That year he erected a city mansion straddling two building lots on West 23rd Street at Nos. 49 and 51. As the century progressed and the city’s entertainment district established itself along 23rd Street, many of the wealthy residents moved on. 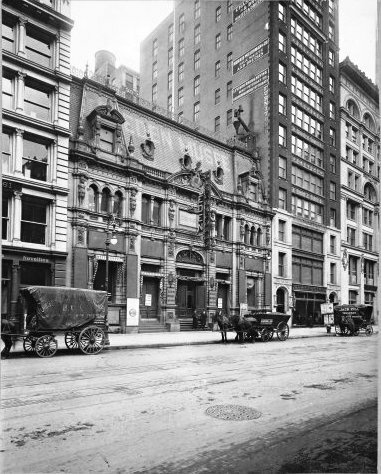 But William Schermerhorn resiliently stayed put in his brick and stone mansion, even as the Eden Musee Theatre was built directly next door. A year later Fannie died, relieving Samuel Bridgham of Mrs. Schermerhorn’s injunction. Now alone in the anachronistic mansion, he looked for a home in a more residential and fashionable neighborhood. On March 19, 1908 The New York Times noted that “The old Schermerhorn residence, in Twenty-third Street…has long been one of the most conspicuous landmarks in the central park of the city. Flanked on one side by the Eden Musee and on the other by an eight-story business building, its dignified brownstone front is a striking reminder of the days when business was all below Fourteenth Street and when the fashionable residential secion was along Fifth Avenue south of Madison Square. Within a few days of The Times article, Bridgman had purchased a new home at No. 954 Fifth Avenue and “the old Schermerhorn mansion at 49 West twenty-third Street will probably be abandoned and a new business structure erected on the site,” reported The New York Times. In the meantime furniture manufacturers and dealers Geiger & Braverman were expanding into real estate. 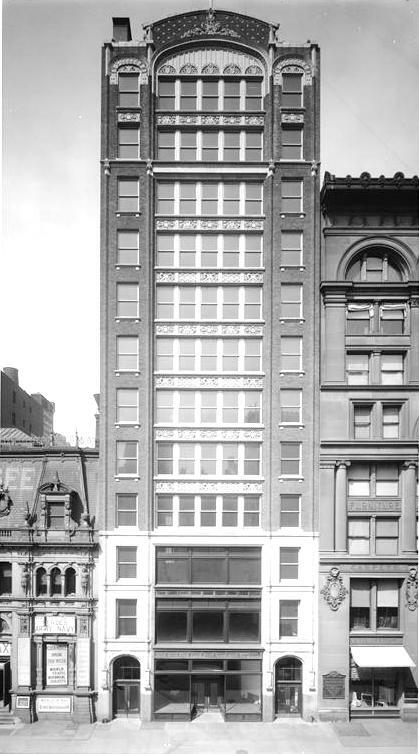 In 1905 they opened a “general real estate and building business” office, according to the Real Estate Record and Builders’ Guide, at 198 Broadway. “These gentlemen are well known in the real estate field and furniture business,” said the Guide, and were already completing two apartment houses on 120th Street near 7th Avenue. 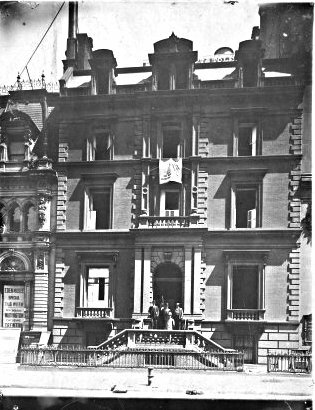 It was the Nameloc Company, however, that acquired the Schermerhorn mansion and in its place erected a 12-story store and loft building designed by Schwartz & Gross. But it would be home to the Geiger & Braverman’s retail furniture business—a location that made perfect sense. By now other furniture manufacturers had established themselves on the block—Robert J. Horner had erected his handsome limestone store next door at Nos. 61-65 and just to the west was the George C. Flint furniture store at No. 43. Designed in what has been termed the “Modern French” style, the understated lower three floors were clad in limestone and featured a central section of expansive show windows. The retail entrance was deeply recessed within arcade show windows—a recent innovation. Above, nine floors of brick and terra cotta melded Art Nouveau and neo-Gothic in an unexpected, unabashedly 20th century composition. A marvelous parapet capped a gentle arch that harbored colorful terra cotta shields. Up-to-the-minute Art Nouveau panels coexist with more traditional architectural details. The upper lofts filled with various small manufacturers like S. Khoury & Co., Charles Iger, shirtwaist manufacturer, United Novelty Company, and Cohen & Feinberg while Geiger & Braverman sold furniture in the lower three floors. A writer for the New-York Tribune was impressed with the modern furniture offered in June 1915. Burgess was charged with accepting $184 as his share of the take. The Bravermans continued to branch out and opened an upholstery firm in the building in 1919, Braverman & Weiss, Inc. Brothers Charles and Solomon Braverman partnered with Joseph Weiss in the logical adjunct to their furniture business. Other small firms like Rosenbaum & Lipner, makers of men’s neckwear; Michael Kolber; Bernard, Bernard & Co.; and Michael Addison, corset and underwear manufacturers, filled the building in the first decades of the century. Throughout the 20th century the building saw various stores and offices come and go; however little changed outwardly. Today a mattress store fills the street level retail space where Geiger & Braverman sold teacarts and wicker plant stands. The out-of-the-ordinary early 20th century structure is worth a pause and an upward glance. Do you know how the name "Schermerhorn" was pronounced? I read once (in a book about the Astors into whose family Caroline Schermerhorn married) that it was pronounced something like "Skermern", but two nights ago I was watching a documentary about the New York waterfront and the narrator pronounced Schermerhorn Row about a dozen times as "Skermerorn". I also rather like the Schermerhorn house. Any idea who the architect was? I always thought it was pronounced "Skairmerhorn." Could it be true that even as early as 1915, the phrase "chaise longue" had been Bowdlerized into "chaise lounge"? No. You can thank 21st century technology--auto correct--for that. Thanks for catching it! I'm just writing to let you know that I love this blog. It really makes the old buildings come to life. First-rate research, too!